My beautiful wife took a day-long performance seminar Saturday in Philadelphia with Ansuya, one of the undisputed superstars of modern American belly-dance. She reports Ansuya "worked our butts off," but was completely involved, down-to-earth, open to every question. At the end of it all, wife said, "I think she's my new hero." After the seminar we went to dinner at a great Irish place that had Belgian beer on tap (go figure), then returned for a performance concert. About a dozen belly-dancers got up and did their thing, one by one. Some were entertaining, some had skills. All of them moved to music. Sometimes they wrapped themselves up in the performance so tightly it felt like voyeurism to be watching them. Others chased the music around the room. Then, at the end, Ansuya came out. She cued the tape, and the music swelled and she just lit up, improvising every move. I have seen nothing so stunning and powerful in decades. She wasn't a dancer, and it wasn't music. She was an elemental force that pulled music into her body and merged both into something more than human. And she radiated into the room, even when her eyes were closed, and she drew the room's energy into herself, too, so that for the first time in the evening I found my foot stomping, my hands clapping. Her face was full serene. She didn't even break a sweat. Yet every moment of her performance she was working two or three different isolation movements together -- hip rotations and shoulder shimmies and arm motions, all at once, any one of which would have taxed the abilities of most dancers -- and in each moment she was not only full on moving the music, she was in transition to the next set of movements. She put the zills to work, and for the first time in a live performance, I understood zills. She wasn't just clacking along to the music but she layered something over top of it all, like a soprano saxophone jazz riff dancing on top of a pounding melody, like butterflies drawn to the unfolding rose of the dance. Layer upon layer of ability spun up like non-stop sensual lightning from the supple body of one woman. When I was a sportswriter, I got to see athletes at the peak of their game. Gretzky, for instance. They didn't just perform well, they made things happen. They controlled a space and everyone in it, with a perfect flow of mental-into-physical energy. They owned their muscle and bone and their skill, and they took that ownership and projected it into everyone around them. So did Ansuya. You don't forget those moments, when you see them. They're times you lie awake and what you saw plays over in your head and you think, is that really a mortal quality? Is there any way to produce that out of the same stuff that I'm made from? This weekend the wife and I went to see a performance of Bellydance Superstars, a traveling revue featuring some of the top names in the American branch of the ancient art. Somehow I came out of this getting praised for being one of the few husbands who would willingly sit through a series of sensual dances performed by striking and supple women in glamorous and revealing costumes. Some days I just feel lucky. I've been a fan of this art form for many years, and I was particularly impressed by the work of two of the dancers we saw Sunday, Petite Jamilla and Moria. Both impressed me, though they hardly could be more different, since each represents one of the two different paths of development in modern American belly-dance. 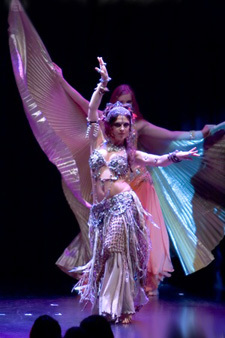 Moria, on the other hand, performs in the "tribal" style that has been percolating on the West Coast: tribal-style belly dance is more intentionally expression than entertainment. This approach to the dance turns it from the performance, toward the personal. When you watch it, you feel more like you're eavesdropping. Its costuming also sets it apart: goth-influenced, based in black, and dripping with chunky accessories. In general, I favor cabaret style, though Tribal, when it's done well, leaves me in awe of the artistry and athleticism. Yet Jamilla and Moria were most impressive to me in dances that transcended these styles. Jamilla performed a four-veil dance with dervish intensity, in which she seemed deeply tranced. And Moria held me rapt with her share of a bellydance-flamenco fusion number. Afterwards, I read Moria has a background in yoga, and realizing that made everything click. Tribal dance tends to be so focused on intense single motions, but when you string it all together as a dance, the effect can be mechanical in less capable dancers. Moria's motion flowed from hips to belly and up into her arms. It was literally fluid, where it might have been modular, and she allowed it to appear both intense and effortless. I can't find a good video clip of Moria. But I've seen many dancers try to follow in Rachel's footsteps. Moria actually can keep up with her, and not merely imitate. Yet all this we saw in a private school auditorium, with a few dozen vocal fans in the audience. Afterward, we mingled with the dancers. Here's a picture of me with Petite Jamilla (on the right) and Colleen, another excellent veteran dancer in the troupe. How can I make this relevant to you? In the world of belly-dance, these are incomparable stars. If I were like many of my co-workers, and obsessed with late '60s rock, this would be like standing with Bob Dylan on one arm and Neil Young on the other. Take my word for it, though: My situation above is on the whole much more pleasant. Ⓒ November 20, 2006 Douglas Harper Moe: "Say, what's a good word for scrutiny?" Shemp: "uh ... SCRUTINY!"